The increasing interest in eSports has compelled many brands to start targeting the eSports audience in their marketing campaigns. Among the many eSports marketing tactics they have been implementing, partnering with influencers in the industry is a fairly new concept. In spite of its newness, eSports influencer marketing offers brands immense value. Due to their reach and engagement, influencers in the gaming and eSports landscapes can significantly amplify your marketing efforts. Their reach isn’t just confined to the gaming and tech industries either. 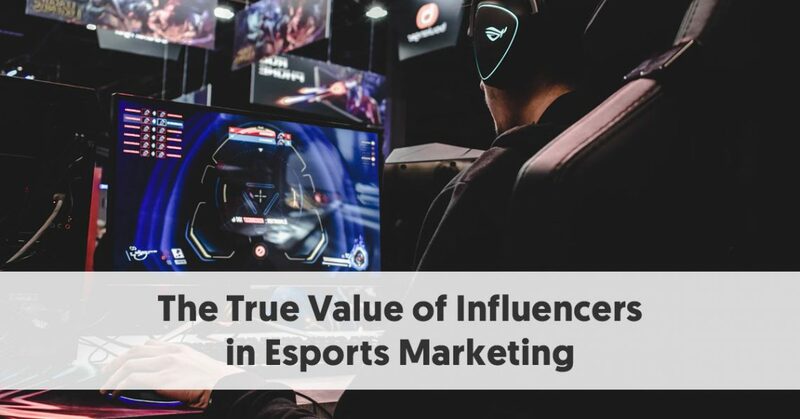 In this post, you will learn about the true value of influencers in eSports marketing and how they can benefit your campaigns. The influence of eSports influencers isn’t just confined to eSports events and tournaments. Their reach extends much farther than that and could even impact audiences outside of the gaming niche. While they’re mostly on Twitch, they also have massive reach across other social media platforms. This is one of the reasons why eSports influencers are so valuable for brands, even if they’re not relevant to gaming. To better understand how much reach eSports influencers have, let’s take a closer look at some of the top gaming and eSports influencers. Ninja is one of the top Twitch streamers and is part of Luminosity gaming. He currently boasts of more than 13 million followers, and his Twitch videos get tens of thousands of views. He commands the same reach on Instagram, where he has around 13.2 million followers. Although his Twitter following is much lower than on other platforms at 4 million, that’s still a lot bigger than many other influencers. 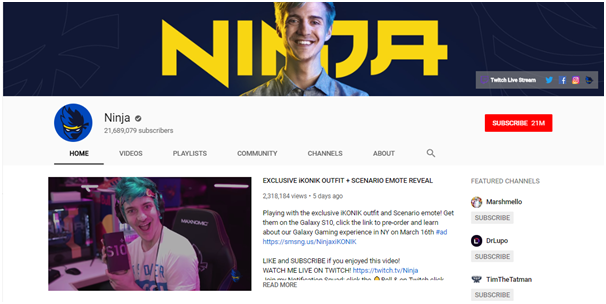 Ninja’s influence is the highest on YouTube, where he has 21 million subscribers. On YouTube, he has even created sponsored content to promote brands like Samsung. He has also been known to create sponsored content for non-gaming brands like Red Bull on Twitch. Shroud is another top influencer on Twitch who once led the Cloud 9 team. Although he left professional eSports in 2018, his influence in the industry has not waned. On Twitter, he has close to 6 million followers, and his influence isn’t just limited to one platform either. While he mostly uses Twitch to broadcast live gaming sessions, he also uses YouTube to create other gaming-related content. 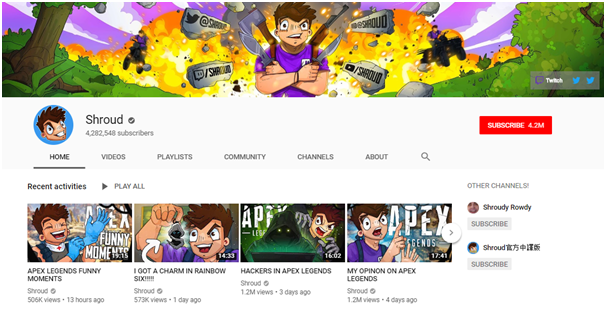 He has 4.2 million subscribers on the platform, and his videos get millions of views. Shroud also commands a massive following on other social media channels like Twitter and Instagram. He has about a million followers on each platform, which is a much bigger follower count than the average mid-tier influencer. Mid-tier influencers typically have an audience size of around 50,000 to 500,000. Another popular eSports influencer is DrLupo, the captain of Team Rogue. 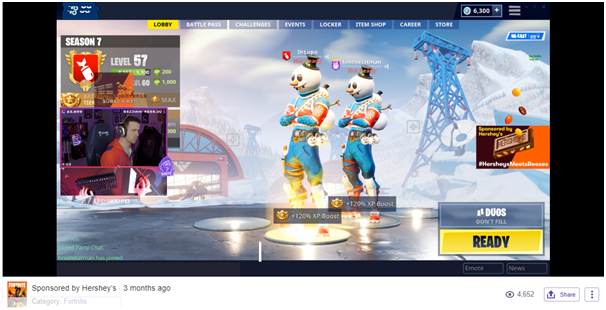 He commands a following of over 3 million on Twitch and his influence seems to be consistent throughout other platforms. On Twitter and YouTube, he has an audience size of 1 million each, which is smaller but still extremely significant. On Instagram, however, he commands an even bigger audience than on Twitch. He currently has about 3.4 million followers on the platform. So it’s clear to see that the biggest eSports influencers command a huge following on gaming-specific platforms like Twitch. However, their influence isn’t just limited to this one platform either. They still have massive reach across other social media platforms that other consumers use. This means that they also have the potential to reach the average consumer even if they promote brands unrelated to gaming and eSports. Based on the previous point, you can understand that eSports influencers offer tons of value in terms of reach. But if you’re familiar with influencer marketing, you already know that following size alone isn’t enough to determine how much influence someone has. Even then, you’ll be happy to learn that eSports influencers are known to drive tons of engagement for their content. They keep their audiences engaged with fun commentary and start authentic conversations around various topics. So even on social media platforms like Instagram and Twitter, they tend to drive a lot of engagement for their content. Let’s take a look at the engagement rates of the top eSports influencers that we previously mentioned to better understand this. 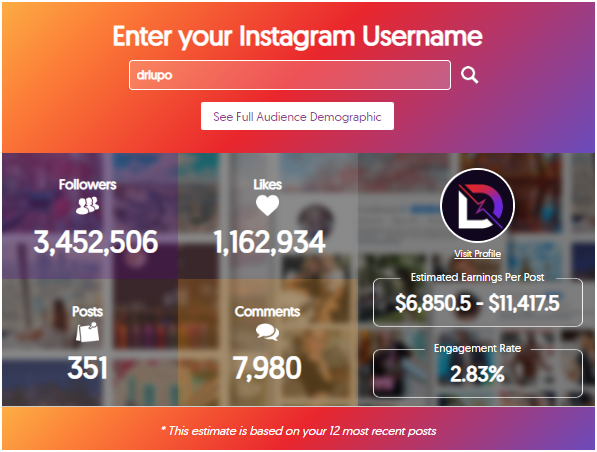 According to the Instagram Money Calculator, DrLupo has an average engagement rate of 2.83%. To put this into context, the average engagement rate on Instagram is between 1% and 3.5%. So his engagement rate is towards the higher side. 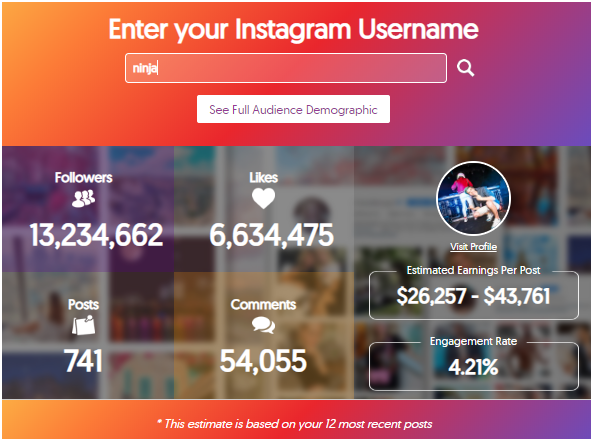 Ninja has an even better engagement rate of 4.21%. 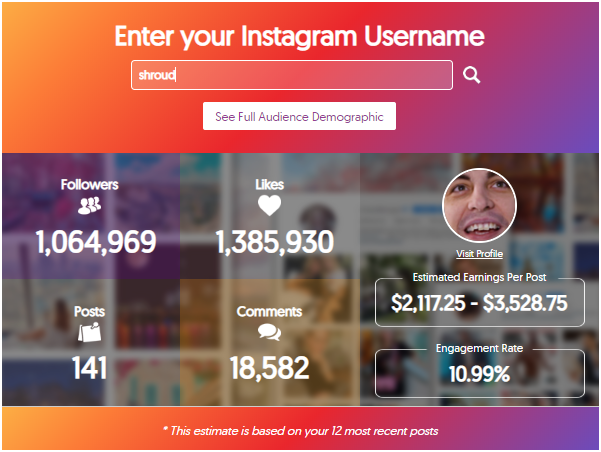 This far exceeds the average engagement rate of most influencers and users on the platform. The number clearly shows that this influencer doesn’t have just a high follower count but also manages to keep a decent amount of those followers engaged with his content. What’s even more impressive is that Shroud manages to drive an engagement rate of 10.99%. This shockingly high engagement rate suggests that his content on Instagram is interesting and highly engaging for his fans. If you go through his Instagram profile, you will see that most of his videos have garnered more than 500,000 views each. That’s twice the number of followers he has on the platform. Some videos have even managed to get views far exceeding the number of followers he has. These numbers are clear proof that influencers in the eSports industry are much better than influencers in other niches at driving engagement. It also suggests that the eSports audience is much more engaged than the average consumer – all the more reason for brands to get involved in eSports marketing. If you go through the content posted by these influencers, you’ll find that it’s usually a mix of gaming-related content and photos showcasing their personal lives. They present themselves in a down-to-earth and relatable manner, which is essential for developing authentic connections with their fan base. So it’s only natural that their fans will feel a deeper connection with them and will find them relatable. Combined with the fact that they produce content relevant to their fans’ interests, it’s only natural that they would drive such high levels of engagement across social media. What this means for brands is that these influencers will be able to drive authentic conversations around your product. They’ll know exactly how to present your brand and product in a way that will make their fans listen. This is crucial if you want your sponsored content and influencer marketing campaigns to have an actual impact. Base on these numbers, it’s clear for anyone to see that influencers in eSports marketing can effectively raise brand awareness. Since they have massive reach across various platforms and have highly engaged audiences, you’re bound to see a significant impact. So you will find both gaming and non-gaming brands partnering with them for their marketing campaigns. Hershey’s, for instance, decided to partner with DrLupo and Ninja to promote their new Reese’s Pieces chocolate bar. While the company has previously worked with influencers in the past, they mostly used traditional platforms like Facebook and Twitter. For this campaign, their primary channel was Twitch with YouTube, Twitter, and Instagram serving as secondary platforms. The duo promoted the product through a collaborative livestream, which is very natural because they have been playing together since 2017. They managed to engage an average of almost 70,000 concurrent viewers throughout this sponsored session. This clearly shows just how much of an impact eSports influencers can have in raising brand awareness. The first two points show how influencers in eSports offer tons of value in terms of reach and engagement. But does that mean they’re driving actual, measurable results for brands? That’s what matters the most for brands that are planning to work with eSports influencers. Even if the influencer manages to reach millions of people with the brand’s sponsored content, some brands may not be satisfied with this if it doesn’t result in action. You’ll only be getting exposure but no actual sales, which wouldn’t be sustainable for some businesses. However, some brands that are only aiming for brand awareness may have no problem with this. In the case of eSports influencers, you can witness measurable results in the form of sales. 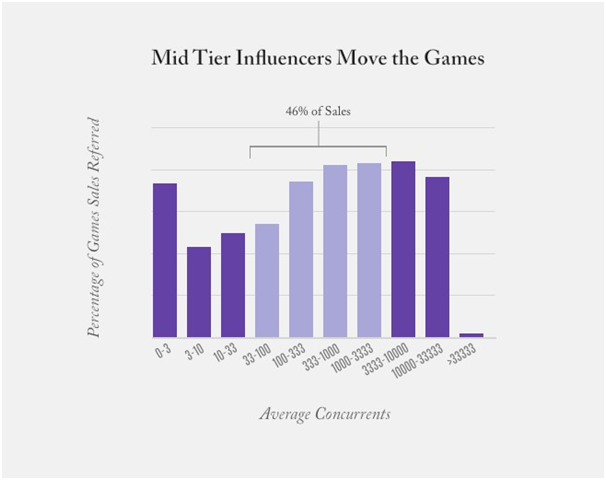 According to Twitch, mid-tier influencers drove 46% of game sales coming from the platform. This is definite proof that eSports influencers also provide value by driving conversions and boosting revenue for brands. In addition to these points, influencers in the eSports industry may offer a lot more value to brands for their marketing campaigns. These are the main benefits that stand out with provable numbers. As discussed, these influencers have a ton of influence over their fan bases. They have massive reach and drive a lot of engagement, which is crucial if you want people to pay attention to your brand. They help you raise brand awareness and can even drive actual sales, especially for gaming and tech brands. Make the most of these insights to evaluate the benefits of working with eSports influencers for your brand.